This recipe is quickly becoming a regular in my rotation. Whether it is a birthday party, work pot luck or a Saturday afternoon snack for Monkey, this recipe is always a hit! I first tried it at my baby shower, my cousin’s wife made it and I think I probably ate most of it myself that night. I have gone on to make it for Monkey’s baptism, a friends birthday pot luck, Monkey’s first birthday and a Saturday afternoon when I just wanted something yummy with vegetables. I have no idea where the recipe came from originally, to me it’s Nicole’s pot luck pizza! 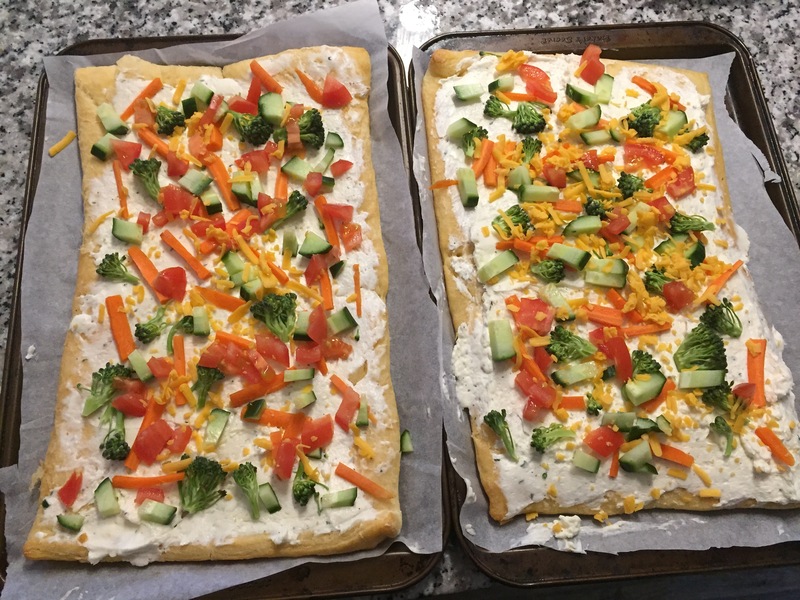 Once the dough is cooled spread cream cheese mixture evenly over the dough and top with your favourite vegetables and cheese. What is your go to pot luck recipe? Let me know in the comments below I would love to try it out at the next office gathering! Yum, this sounds so good! And I love how easy it is to prepare. Thank you! It is so easy and quick to make. Thank you! I also like blanched asparagus and red onions on it! I have made this in the past, and it is always a crowd-pleaser! This looks so good and so easy to make! We might have to make this tonight. 🙂 Thanks for the share. Thanks! It is a great one and a fun way to get extra veggies into the littles! This sounds really interesting! I will have to give it a try! Thank you! Thank you it is one of my favourites! I’ve heard of this before! The person who made it for me called it “bubble pizza” – so yum! I had never had it before my shower and then I was hooked! My mouth is watering! That looks and sounds so good. This looks so good and sounds so easy! My favorite kind of pizza!! Yes so easy! From start to finish it was less time than bath time with a 13 month old lol! Yum!!! And so simple and colorful. I pinned it for future reference! Yum! My mom makes something similar and it is always a favorite! It is so good isn’t it! Thank you! Its also yummy for afternoon snacks! That looks great and what a fun way to use up (and get the kids to eat up) all those healthy and colourful veggies! Yum! It’s lunchtime and now I have to eat!! Good and simple?! Yes please! I could eat cream cheese with a spoon!